We are back on land! We arrived this morning in Yokohama, one of Japan’s major port cities. The last couple of days at sea were rough, as we out-manoeuvred a storm. Although we went around it, we still had 17-20 foot waves. The captain told us that if we had hit the storm, the sea swells would have been 50 feet! Honestly, I was a little green. Everyone else was fine. We had a really fantastic day today. We left the ship about 8:00 am and we spent the morning walking around Yokohama, mainly in Chinatown (odd, I know, as we are in Japan) but it was a really fantastic neighbourhood, and the dumplings were great. In the afternoon we started one of Semester at Sea’s Field Programs, which took us to the Cup Noodle Museum (an enormous, 5 story building dedicated to the inventor of Cup Noodle/Ramen noodles, and to the noodles themselves). We actually got to design our own Cup Noodles (choose the soup, the ingredients, etc.) and bring them home with us. Several floors were dedicated to creativity and human invention. it’s hard to describe, really, and I think quite Japanese. We saw other aspects of Yokohama and then concluded the day with about a 90 minute ride into the mountains, to Hakone, at the base of Mt. Fuji. We are spending the night here in a traditional Japanese ryokan, or hot springs hotel. Well, not exactly traditional, as we were given “Western” chairs in our private dining room (in other rooms the Japanese sat on the floor). Also, we are not on traditional futons on the floor, but actual beds. But we did take off our shoes inside the lobby door – they will remain in a locked locker until we leave. How to describe this place? Well, it’s gorgeous, but very different. 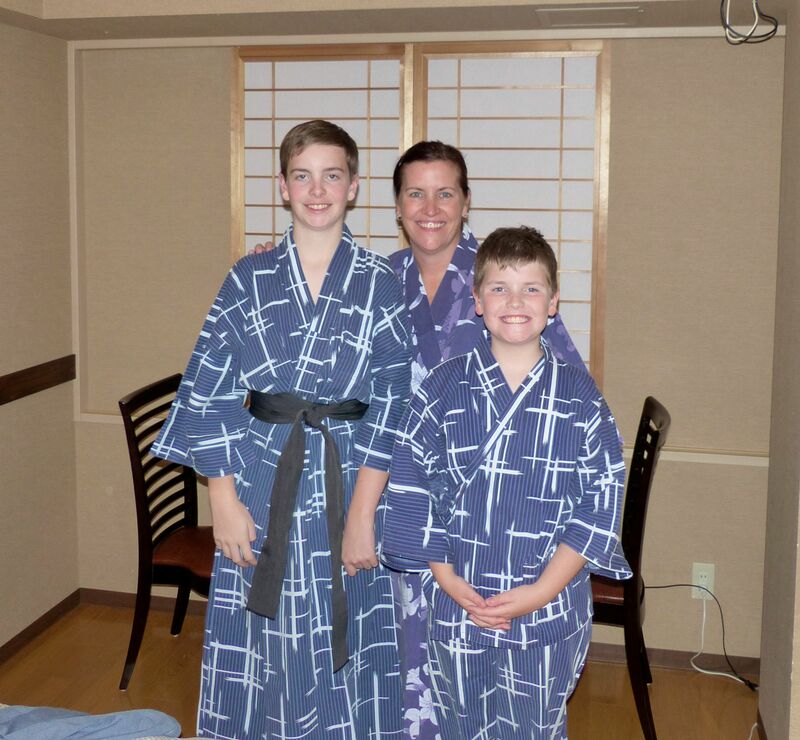 We were given kimono robes at check-in, although Joe was small enough for more like a pyjama get-up. Everyone actually wears these, and the matching socks, to eat dinner! Dinner was a buffet of Japanese and Western food. Fantastic. And then there are the hot springs, or Japanese baths. Completely gender segregated, ’cause everyone is buck naked. Gorgeous shower area, where you shower sitting down in a room of other naked people showering sitting down. Then, when clean, you proceed to one of many hot springs pools. Some were inside, and some outside. it’s quite cool at night in the mountains (probably about zero) so I preferred the outside ones, looking up at the stars and the mountains, with a little rain falling on me. Once you get over the nakedness, it was heavenly. Needless to say, the entire concept seriously disturbed Jack and Joe, and they wanted no part of it. Their loss!